"I recently hired this team to produce a marketing video for our company. I expected a web-quality production, but was pleasantly surprised to see that this video could easily run on national television as a commercial. It would fit right with other commercials which likely cost into the hundreds of thousands of dollars. Needless to say, we are happy with the value! Izzy directed this project with finesse and pulled the very best out of his team. Well done Izzy! I’d recommend you to anyone looking for a director!" Art Docent's popular Program provides a sequential, interactive education in art history and artistic skills. Initially developed in 1984 by art educator and author Barbara Herberholz, the Art DocentProgram™ has been periodically updated. It has a proven track record of over 30 years in hundreds of schools using posters of famous works of art. All 336 images of the artworks are accessible via the internet and can be projected onto a whiteboard or wall. Docents make classroom presentations, eight per grade level, based on themes such as Musicians, Cities, Trains or Pets. What is an Art Docent? A Docent is a volunteer who leads tours in an art museum. In the Art Docent Program™, parents and teachers bring digital images of works of art to elementary classrooms and conduct discussions called Gallery Visits. Docents can download the Docent Guide for all the necessary material for the discussion. No prior art background is needed. What is a Gallery Visit? A Gallery Visit is an interactive 20-45 minute discussion about the artworks and artists. Rather than showing one artwork per lesson, they take a “museum approach” where students view several artworks. These visits are based on thematic groupings and allow students to observe differences and similarities among six artworks at a time. Students participate in and contribute to the discussion. By learning how to observe, analyze, interpret and respond to the artworks, the students are developing skills that will carry over when they go to art museums. What is a Studio Lesson? 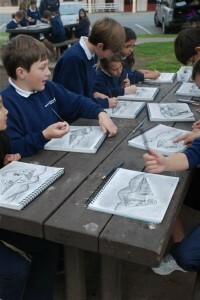 Students develop their own artistic skills through Studio Lessons using a wide variety of media and techniques: painting, collage, oil pastels, print making, cut paper, etc. The Art Docent lesson program does not have children imitate an artist’s work; rather, students express their creative ideas based on the theme of the Gallery Visit. Each lesson follows the Gallery Visit’s theme and includes how-steps, motivation, and a list of materials needed. 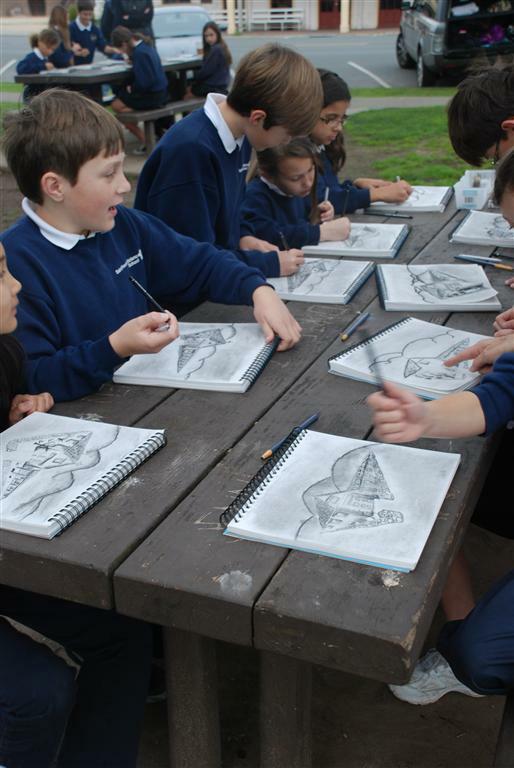 The Art Docent program is consistent with Common Core Educational Standards.